After the Sri Lankan regime led by Maithripala Sirisena had publicly stated that the continued occupation of civilian properties and any release of them are matters decided by its occupying SL military, D.M. Swaminathan, the SL Minister of Resettlement, has been visiting Jaffna and Ki’inochchi, conducting meetings involving the commanding officers of the SL military and Tamil politicians as well as the civil groups representing the interests of uprooted Eezham Tamils. 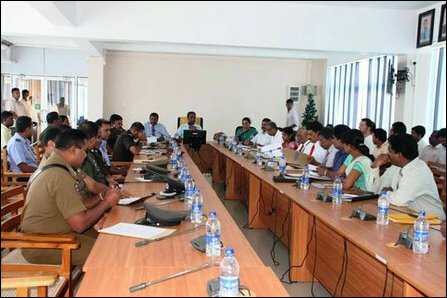 At a ‘facilitation’ meeting chaired by Mr Swaminthan at Ki’linochchi District Secretariat on Wednesday, the representatives of uprooted people refused to accept the explanations given by the Sinhala military commanders for the delay in the resettlement. “Both the SL regime and its military are buying time through entertaining the Eezham Tamils through Mr Swaminathan. A collaborating section of the TNA parliamentarians were mere actors in the drama being staged by the regime,” a civil representative who took part in the meeting told TamilNet. 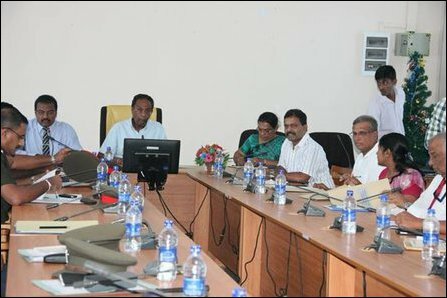 Sumanthiran, Mavai Senathiraja and Sritharan took part in the meeting representing the TNA. The SL military commanders, who were present at the meeting held at Ki’linochchi District Secretariat on Wednesday, said they had no overview of the lands, which was demanded by the public as properties that should be released. The military officers further ‘explained’ that they were just beginning to map out the civilian properties and would contact their top command to get necessary ‘clearance’. EPDP’s parliamentarian Murugesu Chandrakumar and ITAK parliamentarian Sivagnamam Sritharan, were competing with each other in questioning the SL military. They put forward the details and statistics of lands demanded by the people. According to their data, lands and properties belonging to more than 500 families are still occupied by the SL military and police in Ki'linochchi district alone. There are 11 military bases situated in the lands occupied from 180 Tamil families in Karaichchi division alone. Likewise, the properties of at least 27 Tamil families are still occupied by the SL military at In Ka’nadaava’lai division. 380 families are still unable to resettle at Ira’naith-theevu in Poonakari division. The politicians said 807 families are yet to be resettled in Ki’linochchi district. In the meantime, Tamil civil society representatives who took part in the meeting said the SL military was fully aware of the details of the civilian properties it was occupying. The owners of the lands had repeatedly requested the SL military to hand over their properties during the past 5 years, they said. The military has threatened the people who had demanded their properties that they would be sent to ‘military rehabilitation’ if they continued to demand the properties. The military was telling the people that these properties belonged to LTTE and those who claim these properties would be seen as LTTE members and subjected to military rehabilitation. Despite the regime change, the military rule continues in Vanni as before, the civil activists said. Six Village (GS) Officers in Karaichchi division have been recently interdicted following an instruction from the occupying SL military to subject them for ‘military rehabilitation’. “When the GS officers themselves are subjected to such harassments, imagine the fate of average civilians,“ the civil activists told TamilNet. Two weeks ago, 10 Eezham Tamil fishermen were brutally attacked by the occupying SL Navy when their boat had entered a military zone at Ira’nai-theevu after the engine of the boat had failed. This shows the level of SL Navy occupation in Ki'linochchi, the civil activists further told TamilNet. At the meeting staged by Mr Swaminathan at Ki’lnochchi District Secretariat on Wednesday, Tamil civil activists pointed out that 257 families were still unable to resettle in Mukamaalai area, which was earlier a military High Security Zone. “It is being said that the de-mining process was taking time. Rajapaksa regime severely restricted the independent organisations that could effectively engage in de-mining. The SL military was made the sole competent authority to deal with the affairs. The NGOs such as The Halo Trust were severely restricted. There are only 50 workers of the Halo Trust engaged in de-mining in the former Forward Defence Line (FDL) area in Mukamaalai. The de-mining, if continued at the current pace, will require 10 more years. This is a military tactic. Who knows what is in the mind of the occupying military, which may even seize the area for militarization in the future,” a civil activist told TamilNet after the meeting. More than 17,000 families, who have resettled at various places in Vanni, are yet to be utilized with housing and basic infrastructure, the activist further said.